Debate? Or more political ads? Kent, I got your letter (copy below.) Rather than waste money on an ad campaign, why don't you and I sponsor a series of talks where both sides of the issue will be presented by national experts? We are today starting to raise money to fight for the defeat of 140 and 98. I'll pledge to contribute what we collect for Save the Caucus if you'll do the same with the committee you have formed. Call me. (303)861-1447 ok? Can I buy you lunch today? John Wren, registered agent, Save the Caucus, a Colorado Political Committee. I signed on to be chairman of the Let Colorado Vote initiative because I think that the more people who participate in our democracy, the stronger our country becomes. And the way Colorado is doing things – closing elections to unaffiliated voters and depressing turnout with terribly inconvenient and unrepresentative caucuses – isn’t healthy. We have to do better. Let Colorado Vote is working on two ballot initiatives: one to reinstate a presidential primary and another to open primaries to all voters. I’m thrilled both initiatives have qualified for the ballot and are going straight to the voters this November. But we’re facing a critical end-of-month fundraising deadline, and we’re still short of our goal. Not closing that gap means we’ll have to cut back on our plans to hire organizers, run ads and educate voters. I’m asking for your help. Can you make a donation before our midnight deadline to help us hit our goal? Paid for by Let Colorado Vote 2016. This email was sent to johnswren@aol.com. To stop receiving emails, click here. Thinking: wonderful servant; terrible master. Powerful poem below, dramatic alarm on this first day of the short time here on earth even the youngest of us has left. Keats reminds that each of us can do many things with those remaining days, but not everything. The temptation is to get stuck thinking about the Possiblities and then do nothing. Ben Franklin asked himself each morning, "What good may I do today?" Then he went and did it. He believed the best way to worship God was to do Good for those He had created. What good may I do TODAY? Then go do it! Don't think it away! Trust the little I can do with God's help is enough. To do nothing because I can't do everything is greed. The Startup Show: "Starting a career in politics." What does "American dream" mean? Both of our Let Colorado Vote initiatives have officially qualified for the ballot. This is an important milestone in our work to strengthen our democracy. Reinstating a presidential primary and opening up primaries to Colorado's 1.3 million unaffiliated voters will make our elections more open and more fair for all Coloradans. 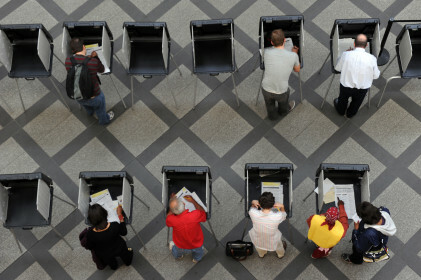 We can’t let our focus slip, though, because qualifying for the ballot was just a first step. Now the real work begins: getting these propositions passed. That means building a dedicated on-the-ground team that will connect with voters to make sure they know what a “yes” vote will mean – especially unaffiliated Coloradans, who make up more than one-third of the electorate. With Election Day coming up fast, we don’t have time to make up for a missed fundraising goal. Can we count on you for a donation to restore fairness and increase participation in our elections? Donate now to help us go straight to the voters to enact these propositions and expand voter engagement in Colorado. We can’t thank you enough for helping make sure every Coloradan’s voice is heard. This email was sent to John@JohnWren.com. To stop receiving emails, click here. You can also keep up with Let Colorado Vote on Twitter or Facebook. pertinent statute is included at the end of this e-mail. ballot analysis. It is anticipated that the meeting will be very brief. Thank you for your interest and assistance thus far in the process. Save the Caucus! Take a minute to share with your online friends! Save the Caucus! Check this out: https://t.co/QvJZlGTLvy #Colorado #COPolitics #COleg #COCaucus DO YOU CARE ENOUGH TO RETWEET THIS MESSAGE? Save the Caucus! Start where you are, do what you can! It won't matter who is elected President of the United States if we loose our wonderful Colorado Caucus, the best chance the common person has of serving in elected public office. Founded in 1912, it was part of the package of progressive reforms that gave more power to the grassroots. Party bosses didn't like it back then, and today's party bosses are trying once more to kill it. Those who love the Colorado Caucus have to make a choice. Do we raise millions of dollars to fight the well funded campaign that is expected? Or do we get on the phone and call our neighbors? Join us! New Colorado Caucus Clubs. Release: PRESIDENTIAL DEBATE TO KICK OFF NEW EFFORT IN CIVIC EDUCATION. Tickets will be marketed through local chambers of commerce that join new Colorado Caucus Clubs. Don't let Newcomer Kent make Colorado elections like California's! Ever since we first gathered for the Colorado Caucus in neighborhoods across the state in 1914, this is what the political bosses and other powerful people like Newcomer Kent have been trying to force us into, a Presidential Primary, or worse, a convention system where party hacks instead of the rank and file decide who gets on the ballot. 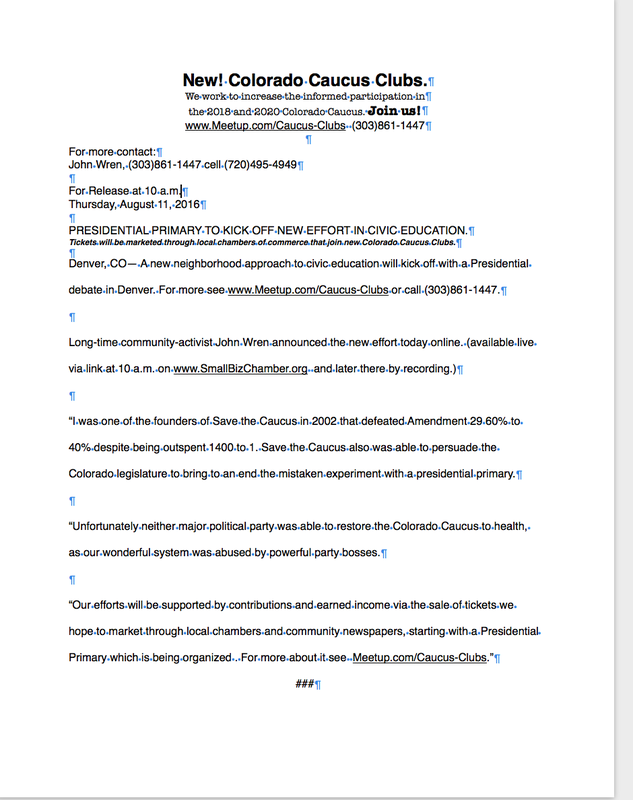 Changing the Colorado Caucus Culture. Every two years Colorado has the opportunity for a state-wide civic lesson. This year it was a disaster. John Wren will talk with culture change expert Lisa Javkson on the Startup Show, see http://www.SmallBizChamber.org then join us for the organizational meeting for Caucus Club August 9, more about it on today's show. Newspaper article about new Caucus Corp.
Caucus Corp is the working name for a new effort to bring civic education to each neighborhood in Colorado. 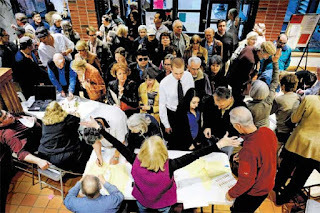 “The Colorado Caucus is under attack again from powerful forces and their dups who have been conned into thinking that a drive by vote in the astro-turf of a presidential primary is better than the grassroots of their neighborhood caucus for a couple of hours every two years,” said John Wren, long-time community activist. 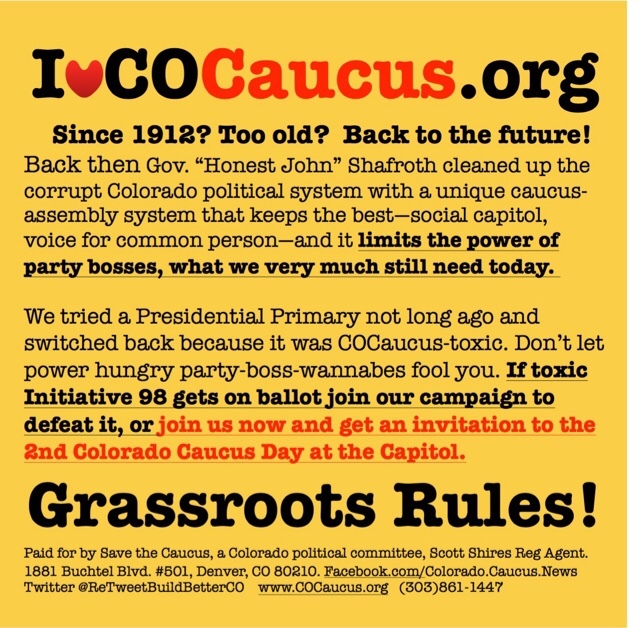 “I’m the registered agent for Save the Caucus, a Colorado political committee. We may have to raise as much as $1 million if out of state money funds a campaign to kill the caucus as expected,” said Wren, “but we are hoping we can get all sides of the issue involved in an educational, not political, campaign in the next couple of weeks. “We just won the fight in the Colorado State House, and it made clear an educational process is what is needed now. We are recruiting a statewide network of volunteers and a steering committee,” says Wren, registered agent with offices at 1881 Buchtel Blvd., #401, Denver. Caucus Corp will not take positions on issues, candidates or party leaders. Free informational meetings will be held Fridays and Saturdays through the end of June about this new Caucus Corp effort. For more see Meetup.com/Caucus-Corp or call (303)861-1447. Gov. Gary Johnson, please read this powerful article, it describes a path that your spiritual trail blazer Martin Luther and Ignatius of Loyola, founder of the Jesuits, both followed that I believe is open to you with an institution today much in need of reform. We certainly don't need a new constitution, we need renewed citizens, which I believe God is calling you to teach us all as President.